My house was built back in 1978 and for some reason, the original design did not feature a food pantry. This week I’ve decided to do something about it. I’ve already torn out a couple of cabinets where we’ve been storing can goods and have committed myself to building a free standing pantry…let’s get started. If you haven’t already, feel free to take a look at the video I posted showing how I constructed this little gem of a pantry. I started this build by constructing the main box shape complete with the two sides, the top, and the bottom. After the main box was built, I inserted the center divider. 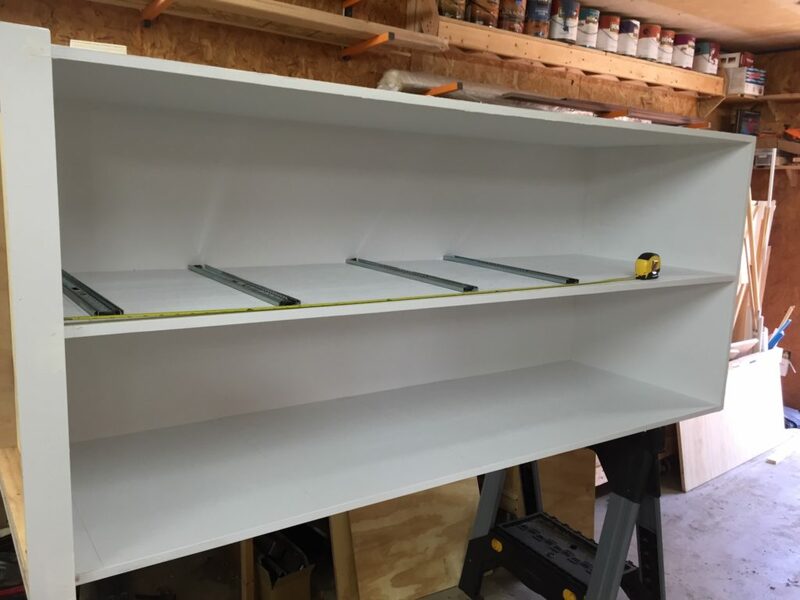 Initially I was building this pantry on top of my table saw and out feed table but started running out of room and transitioned down to the floor. I could already tell it was going to be a very heavy unit once it was fully assembled. Before moving forward with the drawer sliders I gave the entire unit a couple coats of paint. It is best to paint before the drawer slides go in, otherwise I would have to cut in the paint around all of the slides. After letting the paint dry for a while, I laid the unit on its side and installed one half of the drawer slides. Once they were done, I turned the unit onto its opposite side, and then attached the remaining sliders. Now I could focus on building the drawers. I relied on the solid model I designed for this project for dimensioning the drawers. 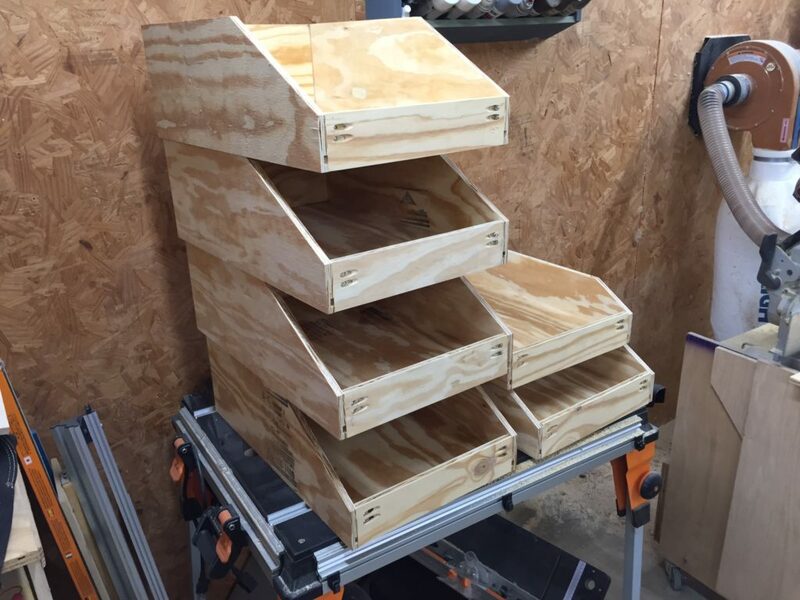 In total I made 8 drawers, 2 can goods organizer/rotators, and 2 wine bottle organizers. Word to the wise: I find it best to paint these drawers after you complete them and before they get installed. The same goes for the wine bottle storage and the can goods rotator. Naturally it would be much more of a hassle to paint after installation. The drawers went very quickly since I have done so many of them in the past and they fit together perfectly. The can goods rotator was a bit more challenging. I’ve never built anything like these before so naturally they took a bit longer. However, this is just another area where it really pays off to have a detailed model or a drawing ahead of time. I designed the entire pantry on the computer before I ever began cutting material. The last piece to make for this pantry was the wine bottle storage. I came up with this design years ago when I first got into woodworking. It’s incredibly easy and works perfectly. Consequently, I had no problem making another one for this pantry. Last but certainly not least, after some finishing touches, is moving this mammoth into position and loading it with groceries. My husband and his brother moved this big thing into position and I finally got to load it down with all sorts of dry goods and wine bottles. I have to say that I am just tickled at how well this came out. Thank you so much for stopping by and supporting what I do. I really appreciate it. Get latest posts sent to your email!